Update: Kai has now been adopted by Ian Russell from Newton Mearns in East Renfrewshire. We wish both of them a long, happy life together! You can find out more details in this BBC report. A dog has been found abandoned at a railway station alongside a suitcase of his belongings. 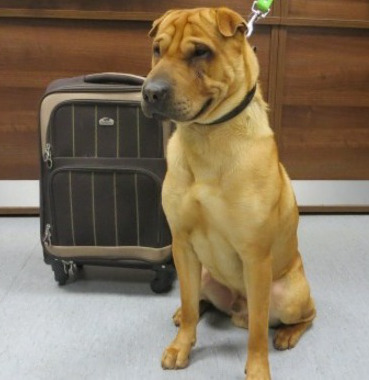 Kai, a male shar-pei crossbreed, was discovered tied to a railing outside Ayr station in Scotland on Friday - alongside luggage containing a pillow, toy, food and bowl. The Scottish SPCA used a microchip to uncover his name and contacted the registered owner, who said he had sold Kai on Gumtree in 2013.